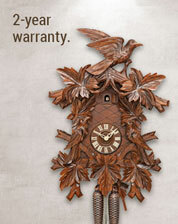 This is a large clock at 20 x 17 x 10 inches (includes clock tower). 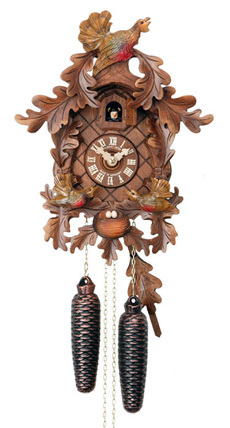 Clock is equipped with a top quality regula movement with automatic nightshutoff, a feature usually reserved for clocks that are priced closer to $2000. 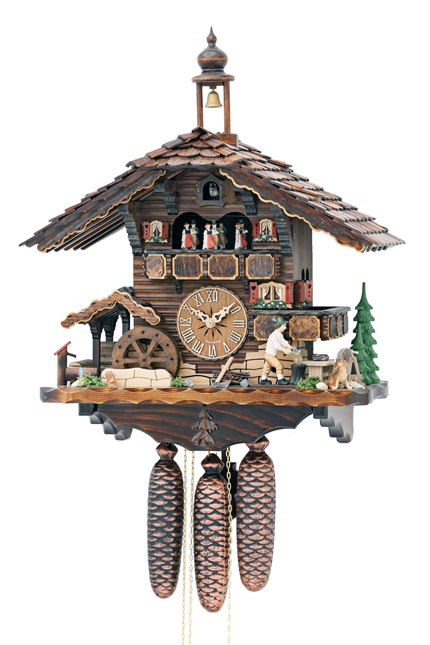 Clock features turning wooden and hand painted dancing couples in traditional Black Forest attire. Turning water wheel & moving wood chopper. Many decorative details. 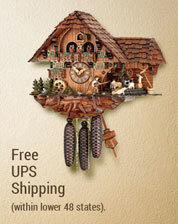 Clock features roof with over 100 hand cut and hand laid wooden shingles and wooden exposed rafters. Solid wooden hand painted figurine of wood chopper. Laser cut windows and red bavarian shutters. 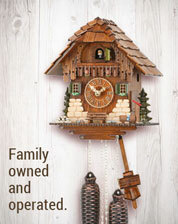 Wooden hands, dial and cuckoo bird & dog. 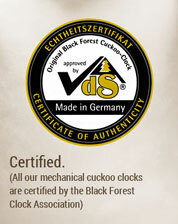 Big bellows create deep cuckoo call.